Astronomers have identified the oldest asteroid families and, by process of elimination, the oldest intact asteroids in the main belt. A team including SwRI scientists developed a technique to identify ancient asteroid families that have drifted apart. 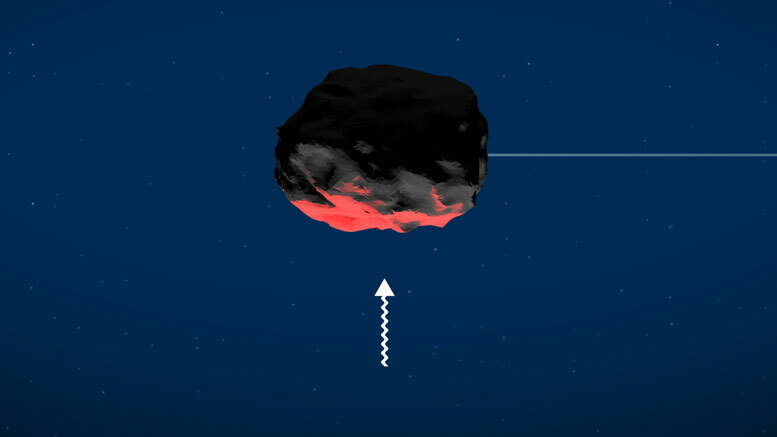 Asteroid surfaces heat up during the day (as illustrated by this image) and cool down at night, giving off radiation that can act as a sort of mini-thruster. This force can cause asteroids to drift widely over time, making it difficult to identify families of fragments leftover after asteroid collisions eons ago. Scientists developed a technique to identify ancient asteroid families, revealing the oldest known asteroid family in the inner region of the main asteroid belt. Southwest Research Institute (SwRI) was part of an international team that recently discovered a relatively unpopulated region of the main asteroid belt, where the few asteroids present are likely pristine relics from early in solar system history. The team used a new search technique that also identified the oldest known asteroid family, which extends throughout the inner region of the main asteroid belt. Rotating asteroids have a tough time sticking to their orbits. Their surfaces heat up during the day and cool down at night, giving off radiation that can act as a sort of mini-thruster. This force, called the Yarkovsky effect, can cause rotating asteroids to drift widely over time, making it hard for scientists to predict their long-term risk to Earth. To learn more about the Yarkovsky effect, NASA is sending a spacecraft called OSIRIS-REx to the near-Earth asteroid Bennu. OSIRIS-REx will observe how Bennu’s shape, brightness, and surface features influence the strength of the Yarkovsky effect, helping scientists to better predict Bennu’s orbit over time and pin down its long-term risk. The team plans to apply this new technique to the entire asteroid belt to reveal more about the history of the solar system by identifying the primordial asteroids versus fragments of collisions. This research was supported by the French National Program of Planetology and the National Science Foundation. Be the first to comment on "SwRI Astronomers Identify the Oldest Known Asteroid Family"